I wrote about external walls last week, this week it’s wooden floors. Problems with wooden floors are much more common in older houses before the advent of cavity walls and damp proof membranes (DPM).Joists were commonly built into potentially damp solid walls. Later, with early cavity walls they were only built into the dry inner skin, and on modern buildings they are built on metal hangers or DPMs and don’t penetrate the walls at all. This is one of many reasons why in my opinion contemporary houses are the best they’ve ever been (a few others being shallow foundations, damp, lack of thermal or sound insulation, and drafts in older buildings). Modern buildings can suffer from shoddy workmanship just like older buildings, but better materials and techniques are now available and we have rigorous Building Regulations. Look for rot or woodworm along the outside walls and particularly in the corners where damp tends to collect. Also look for sinking floors. If there’s a gap of more than about 4mm beneath skirting boards, the skirtings certainly wouldn’t have been fixed that way so it gives warning of possible collapse. Ceilings which have visibly sunk at the edges offer similar evidence. The joists may need splicing or replacing on metal joist hangers built into the wall to isolate the timber from sources of damp. I did this recently and the bill was over a thousand pounds for one room so it’s significant. Ground level floors in older buildings are commonly supported on stubby walls built on dirt in the cellar with no DPM. They inevitably suffer damp damage and woodworm is common (it likes damp and dies in dry wood). The timber bearers should be placed on DPM. Any rotten timbers need replacing with treated timber. 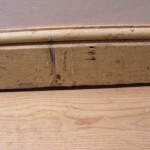 Also cut the ends from any floorboards or joists touching potentially damp walls. Leave a ½” to 1” gap on all sides. The skirting will cover it. Modern buildings have fewer problems with wooden floors. The most common are caused by internal leaks such as slow leaks to baths, showers and plumbing. It’s a good idea to check under the bath if you can. New plaster under the bathroom may indicate a problem covered up but not resolved! In older buildings the joists are usually under-sized by current building regulations and somewhat springy. This isn’t necessarily a problem, but upstairs floors were commonly chopped about at chimney breasts with trimmer joists held up by little more than the plaster. I’ve also come across houses with chimney breasts removed, where the joists which were previously built in have become effectively unsupported and merely wedged into place. Again look for sinking floors and ceilings (see above). I’m thinking of doing solid floors next week.